You've come to the right place. Some folks love growing basil for the wonderful fragrance that it produces. Others love harvesting the leaves for drying or making pesto. Basil is an herb that is simple to plant, easy to maintain and even easier to harvest. Different varieties of basil produce different basil flavors. Some are stronger tasting and more aromatic than others. Some varieties have a hint of cinnamon, licorice or citrus flavor. 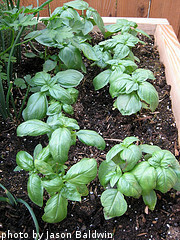 Basil can be used fresh to make a variety of sauces or pesto, or as a flavoring in teas. It can easily be dried and used to season almost any variety of meat, poultry, fish or vegetables. Nothing beats the sweet aroma from a fresh basil plant growing in your garden or on a deck or patio. 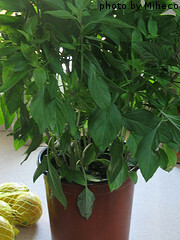 Basil plants vary in size from 8 inches to 24 inches tall. Growing basil can easily be done in a traditional vegetable garden or in containers. 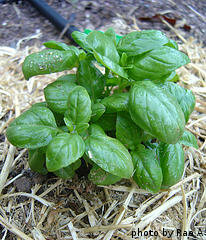 Basil plants need at least 6-8 hours of direct sunlight everyday. They thrive when air temperatures are around 85 degrees F.
Basil is an annual plant, meaning that it will grow for one growing season and then die off. If you want to keep producing basil year after year, you'll have to plant more every year. Growing basil is very cost effective. A small, 1/2 oz bunch of fresh basil at the grocery store might cost $2-$3. An average sized basil plant might cost $3 to grow, including the cost of seeds, water and fertilizer. Your own basil plant can easily produce 5-8oz of fresh basil, sometimes much more, depending on the variety and growing conditions. Plan on growing one basil plant for each member of your household. This will provide enough fresh basil throughout the growing season. If you want additional basil for drying, freezing or making lots of pesto, grow an additional couple of plants. If you have too much, you can always give away the extras to friends and neighbors. How you intend to use your basil will determine which varieties to plant. Some varieties are especially tender with a mild flavor. These varieties are best used fresh or in making pesto. Other varieties have a slightly tougher texture and more pronounced taste and aroma. They can be used for drying and seasoning a wide variety of food or making potpourri. Basil and tomatoes are an excellent flavor combination. Basil can also be used in a wide variety of other recipes.